Repairing differential pinion shaft threads? Posted: Sat Apr 13, 2019 6:53 pm Post subject: Repairing differential pinion shaft threads? Posted: Sat Apr 13, 2019 6:55 pm Post subject: Re: Repairing differential pinion shaft threads? I've narrowed down the issue with my 135. I still can't get the pinion out, but I think I can reassemble it in the tractor. I got a new lock nut and tried to thread it onto the shaft tonight. It won't go because the threads at the front of the shaft are damaged slightly. I'm thinking of trying to use a thread file to repair them. If I can get it to thread on, then my next difficulty is setting the right pre-load. The manual shows this being accomplished outside the tractor and I'm not exactly clear on the tools being used. 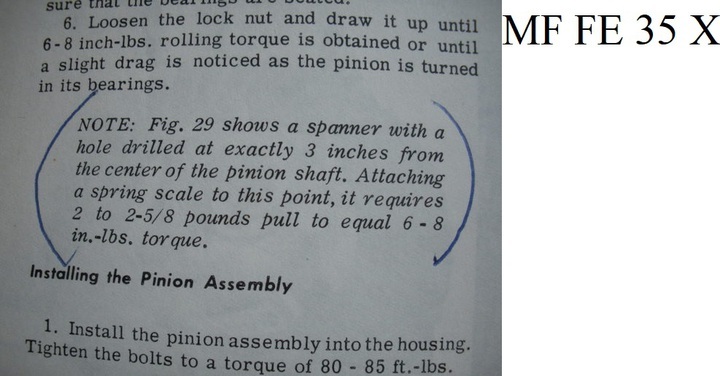 I found this thread showing the use of a c-spanner with a hole 3" from the pinion shaft to set the pre-load. I think this could be done since the shaft won't turn when the wheels are on the ground. If this doesn't work, then is the only other way to remove the pinion involve pulling the left trumpet housing and pulling the ring gear? 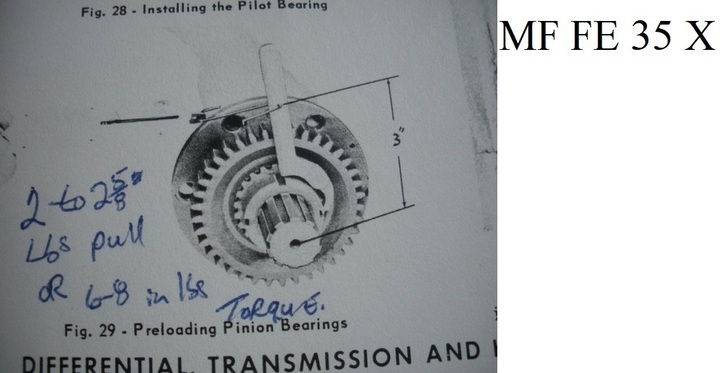 Posted: Sat Apr 13, 2019 8:40 pm Post subject: Re: Repairing differential pinion shaft threads? Posted: Sun Apr 14, 2019 3:35 am Post subject: Re: Repairing differential pinion shaft threads? One big difference I'm seeing is that yours calls for 6-8 in-lb while my manual calls for 20 in-lb. I could probably do the same thing, but applying 6 2/3 lb of pressure with a spring scale, which I don't have laying around. About the closest device I have is a pocket fish scale. Posted: Sun Apr 14, 2019 5:50 pm Post subject: Re: Repairing differential pinion shaft threads? When I set the Torque on my MF FE 35 X I MADE SURE the NUT ran up by had (two fingers) freely! No resistance at all. Posted: Tue Apr 16, 2019 8:57 am Post subject: Re: Repairing differential pinion shaft threads? I was able to clean the threads up with the file. After an initial hard start, the nut threaded on relatively easily. I use a fork seal tool for an old Triumph to tighten it up. I think I over torqued it though, was thinking 20 ft lb vs in lb. I'll have to correct that before I put the cover back on. I don't have the ability to make the tool you describe, but I can put my torque wrench in a vice and use it to get a feel for the right amount of pressure. It should get me close to the "slight drag" mentioned in your manual.